Name the best Engineering institute present in India? Can i pursue M.Tech without giving GATE exam? Where to get training in Kolkata? Is there any training center there? Please give suggestions about colleges in which i can get seat with 1080 rank in PGECET? Can I get any type of government or private college with a UPSEE rank of 100? List of B.Tech colleges on the basis of UPTU ranking? Best college of Engineering in Jaipur, Rajasthan? Which approval required for an Institute to do diploma in mechanical engineering in distance? In which college can I get after scoring 353 rank in PGECET electrical stream? Top 10 colleges for doing M.Tech degree in VLSI & Embedded Systems in Bangalore? Re: Name the best Engineering institute present in India? 1. Candidate should completed the 10+2 qualification from recognized school. 2. Minimum 50% aggregate in academics. Those who qualified in the above exams they choose the best college according to the rank wise. 1. Anna University - Tamil Nadu. 2. JNTU University - Andhra Pradesh. 3. Sahastra University - Tamil Nadu. 4. SRM University - Tamil Nadu. 5. Satyabama University - Tamil Nadu . 8. NIT - Calicut - Kerala. 10. A.C Patil College Of Engineering - MUMBAI. 11. A.V Parike Technology Institute - GUJARAT. 12. ABES Institute of Management - UTTAR PRADESH. 14. ABR College Of Engineering. 16. Academy Of business and engineering college. For searching the engineering colleges and entrance exams see the website http://www.minglebox.com.. In India , Admission in various engineering colleges takes place through various engineering entrance exam. A candidate gets admission in an engineering college depending on the score he/she gets in the respective entrance exam. IIT-JEE exam meant for admissions in top most engineering college viz. Indian Institute of Technology's. These colleges are the best and the most prestigious Engineering Institutes. These colleges have got the best placement record in India. AIEEE exam is meant for admissions into NIT's(national Institute of technology's) and all the other private and government engineering colleges throughout India. SEE exam is differently held in different states. Through this exam one can take admission in engineering colleges in that particular state. Dear, I am providing you names of top engineering colleges on India. you need to crack any of these examinations to get in the engineering colleges!!! YOU MUST TAKE GOOD PREPARATION TO CRACK THE ENTRANCE TESTS .... TAKE PRIVATE COACHING IF REQUIRED....DON'T HESITATE MUCH!!! Now a days Engineering course is getting very much popularity in India. Mostly Science stream choose Engineering as their career after 12th. There are various reasons behind choosing Engineering as their career. The first reason behind its popularity is its scope. The scope of Engineering is increasing day by day. As India is developing, more and more industries are opening in India which increasing the demand of Engineers. Engineering is one of the safest career to pursue after 12th. Engineering degree is a assurance of job. As IT sector companies are increasing in India, so the demand of software engineers are also increasing. But as the demand of Engineering is increasing , more and more students are appearing in various Engineering Entrance exams. Which makes the Engineering as one of the highly competitive profession after 12th. As the competition in Engineering is high and every one wants to achieve good job after engineering. So it is must for you to appear in various Engineering Entrance exams and take admission in Engineering colleges through Entrance Exams like IITJEE, AIEEE etc. If you will complete your Engineering from top institutes like IITs and NITs then there surely you will get a good job. I’m not sure about the best institute in India for Engineering as most of the colleges claim that they are the best. But from my personal experience, I would suggest a best institution in Kerala. It is situated at Calicut which is one of the major cities in Kerala. There is no need to tell that All the IIT's are some of the best collages for engineering. But other than that their are some good collages too list of them are as follow's. There are many good engineering colleges and institutes in India where the candidates can secure their future. 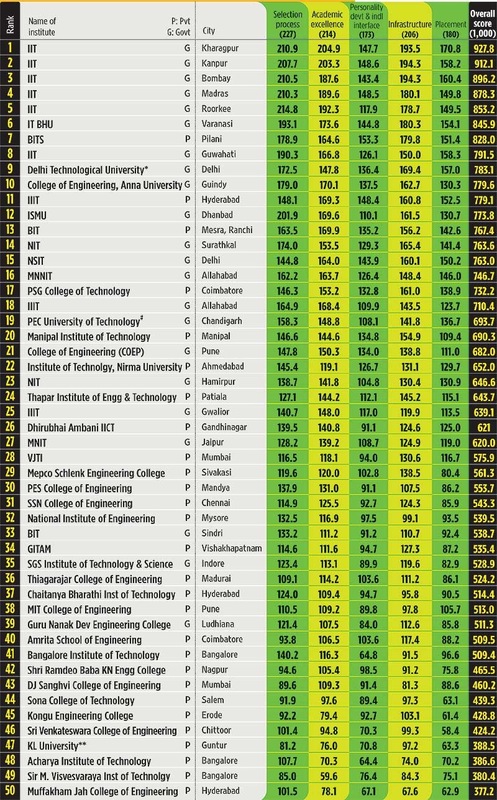 This college list is for 2013 ranking but except IIT and NIT . Engineering course completed graduates have plenty of jobs in all sectors.Here i mentioned the clear details regarding the engineering courses. For entering onto the engineering filed you must completed the intermediate or deploma courses. Indian institute of technology - Guwahati ,kanpur ,chennai ,delhi ,hyderabad, calicut , varanasi ,mumbai etc. Guru nanak engineering and higher studies. There are huge amount of Engineering Institute in India. 10.Univ college of Engg,Osmania Univ,Hyderabad. the best engineering college in India are under ..
if you want to take admission in IIT or AIEEE etc ..you have to pass the entrance examination ...this examination held in generally march month of every year .. Here are the Top 10 Engineering Colleges in India.. Which is the best coaching institute for IES preparation? Best institute for Biotechnology in India? Which is the best institute in India for studying Engineering? What is the salary of Engineers in Miniratna companies? Please provide information about the minimum as well as maximum salary in these companies? Whether all PSU provides same packages to engineers or not?